ITBS is a repetitive stress injury common to both runners and cyclists. If you participate in either of these sports, either you or your training partners have likely experienced this injury. ITBS is characterized by pain on the outside of the knee. Unless you have experienced knee trauma recently, ITBS is most likely the sports injury you are dealing with, not a torn meniscus or knee ligament. The ITB (Illio Tibial Band) is a long tendon (rubber-band like structure that connects muscle to bone) that runs on the outside of the thigh from the hip the knee. 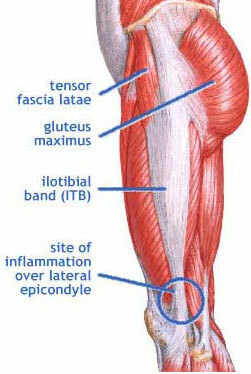 The Gluteus Maximus and Tensor Fascia Latta are the muscles that connect to the ITB. These muscles make a fan shape between the outside top of your pelvis (if you put your hands on your hips, they span from your index finger to thumb), and they narrow to the bony spot at the top outside of your thigh. (Insert image here) The ITB starts at the bottom of this fan shape and travels down the outside of the thigh. It then crosses the knee and inserts just below the knee on the outside of the tibia (lower leg bone). The ITB separates the quadriceps (front thigh muscles) from the hamstrings (back of thigh muscles). If you have ITBS, pain is felt just above the outside of the knee. Most of us do sports that move forward and have little side-to-side motion with the legs. Over time forward only motion weakens the muscles of the ITB. To walk, run or to pedal these muscles work in a small range of motion, which trains the muscles to be strong only in a small zone and causes a loss of flexibility. Sudden increases in training distance or intensity, as well as adding steep hills into run training, can overtax these muscles and tighten them. This creates excessive tension in the ITB and begins to cause friction at the lateral epicondyle (the bony knob at the outside bottom of the thigh bone). When you bend your knee about 30 degrees the ITB normally glides over this bony knob, but if it is too tight the ITB grates over it and gets irritated. Once inflamed, the ITB becomes swollen and will grind over the lateral epicondyle more, making the condition worse as you push through the pain! You have pain at the outside of your knee; what do you do? The first time you experience pain at the outside of the knee it is important to end your workout. Go home and ice the painful area. Rest and ice for three days (no running/hiking/biking; avoid stairs and other activities that involve repetitive bending of the knee). After three days, see how it feels. A minor one-time irritation of the ITB should recover after this rest period, but be on notice that you need to strengthen and lengthen the muscles of the ITB. If, however, three days of gentle care for your inflamed ITB does not alleviate the pain, you most likely have ITBS. ITBS is a fancy tendonitis. For it to heal, you will not only have to address the inflamed tendon, but you will have to address the cause of the excessive tension in the ITB as well. The cause is often a combination of weak/tight ITB muscles, adhesions along the ITB to the quads and hamstrings, muscular or structural imbalances in the pelvis/hip complex, and foot/ankle biomechanics. Cyclists need to make sure they are not in excessive toe-in position when clipped in and runners should replace their running shoes if they have over 250 miles on them. At Focus Bodywork we can help you sleuth the factors in your ITBS, address adhesions in the ITB, treat the associated muscles and recommend self-care practices. Occasionally ITBS is stubborn and needs a physician’s care. In these cases you may need a cortisone injection, orthotics or a regiment prescribed by a physical therapist. We are happy to recommend some fantastic practitioners for you to work with and be a part of your return-to-play team. In our next post we will cover self-care for ITB health. This entry was posted in cycling, Knee, Physiology, Running, Sports Injuries and tagged Gluteus Maximus, Illio Tibial Band, ITB, ITBS, leteral knee pain, Tensor Fascia Latta by focusbodywork. Bookmark the permalink.